I don’t mind if I only sell 100 a year, as long as those 100 people think it’s really good. I wouldn’t make much money but that’s not always the point. That’s not what drives us, that’s not what makes it exciting. 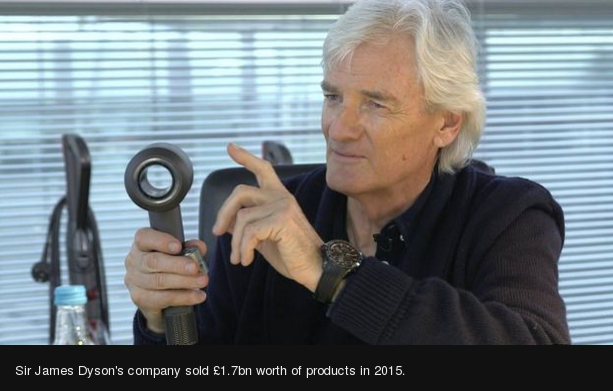 Has Sir James Dyson gone mad? After spending 50 million pounds investigating problems of hair-dryers and launching his own luxury hairdryer retailing at 300 pounds, he says he would be happy to sell just 100 units. As long as his customers are happy. That would generate a revenue of 30,000 pounds. Or roughly a loss of 50 million pounds. To recoup the money roughly 200,000 units would need to be sold. Wow! What a charitable man! The product will launch in Japan, a country of around 200 million, where 96% of likely customers already have a hairdryer. The Dyson company founded by James Dyson, had a turnover of 1.7bn pounds last year, is best known for its bagless vacuum cleaners and high-speed hand dryers, and says it has a further 40 products in development. BBC is reporting about it’s citizen journalist scheme. One lady from Port Talbot in Wales has made a program about the threat to Jobs at the Corus plant there. She was refused a interview with the Corus’ new CEO Kirby Adams, she went to Mumbai and interviewed the head of Tata Steel – Balasubramanian Muthuraman. The second story is scandalous. Workers are staging a sit-in protest over closure of the UK’s only wind turbine plant, and the loss of 625 jobs at Newport in the Isle of White (525 jobs) and Southampton (100). The Dutch parent company says Northern European orders are falling, but at the same time the UK government says we need more “green jobs”. The parent company at the same time reported a quarterly sales rise of 59% to 1.11bn euros.